After receiving an overwhelming response for IndiaMART Leaders of Tomorrow Awards last year, the next edition this year returns with much aplomb. IndiaMART.com and ET NOW promise to bring an experience that is bigger and better, and which covers a larger base of MSMEs than the last time. Together, they have brought on board Ernst & Young (EY), world’s leading professional services organisation, as winner determination process validator and tabulator of all jury processes. EY will evaluate nominations on parameters such as business success. initiative or innovation undertaken and the impact created in the country by the Micro, Small and Medium Enterprises (MSMEs). The Awards are aimed at according due recognition to the small scale enterprises that have proved to be the growth drivers for the Indian economy. Sharing his outlook on this year’s Awards, Mr. Dinesh Agarwal, Founder & CEO, IndiaMART.com, said, “The successful first edition logistics, IT / ITES-BPO / VAS, Travel & hospitality, Healthcare & biotech alongwith two special recognition awards on Woman entrepreneur of the year and SME of the year. IndiaMART Leaders of Tomorrow Awards 2011 goes one step ahead in catapulting small businesses to the forefront by featuring a series of inspiring success stories for 28 consecutive weeks on ET NOW. This will further help in highlighting the importance of MSMEs in the Indian business fraternity. Not only this, these awards will acknowledge the contribution of entrepreneurs in 13 different categories such as Textile, apparels & accessories, FMCG & consumer durables, Pharmaceuticals & medical, Chemicals and petrochemicals, Food and agri products, Home décor and handicrafts, Auto components, Engineering products, Electrical & electronics, Transport the participants which will be further shared with the screening jury. 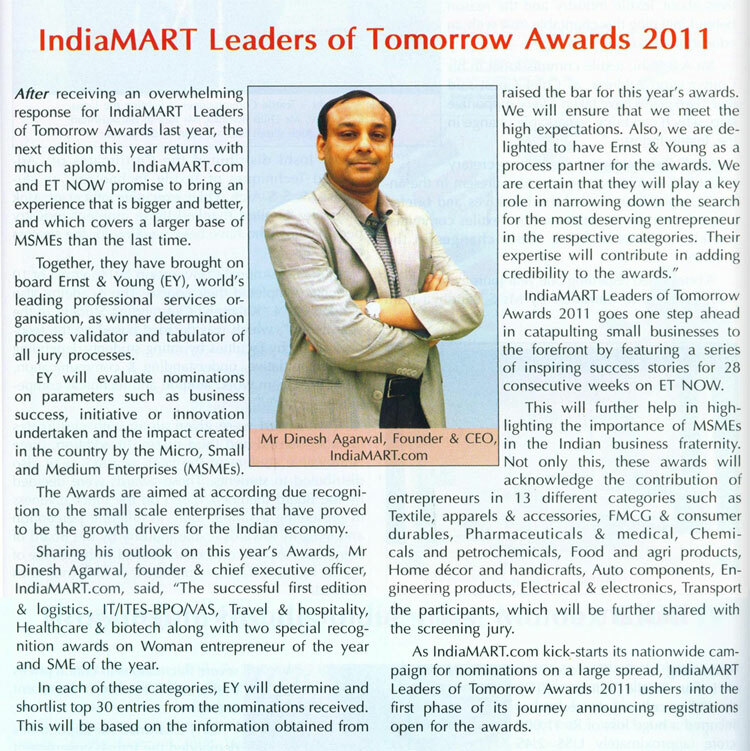 As IndiaMART.com has kick-started its nationwide campaign for nominations on a large spread, IndiaMART Leaders of Tomorrow Awards 2011 is ushered into the first phase of its journey announcing registrations open for the awards.